As wireless technology becomes more advanced, the demand for more sophisticated options to stream media from your mobile device to your HDTV steadily increases. It’s hard to keep track of the various solutions companies are using to deliver this feature to their customers. DLNA, the most popular standard, is compatible with an army of dozens — if not hundreds — of products, while giants like Apple and Samsung have chosen different routes. 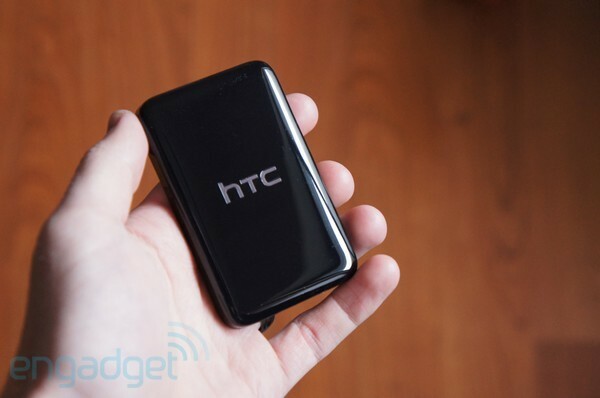 After an arguably unsuccessful attempt at offering the DLNA standard via the original Media Link, HTC has decided to fly solo with the Media Link HD in the hopes that the accessory will add value to the company’s high-end One handsets. We have little doubt that HTC is trying to keep the Media Link HD small and simple: it’s a credit-card-sized dongle that easily fits in the palm of your hand, and only takes a smooth, three-finger gesture to pair it up with your One X or One S. Once connected, it gives you the opportunity to stream movies to your television and perform other tasks on your phone at the same time. A solid concept, to be sure, but is it worth shelling out at least $90 for this little darling? Tune in below to find out. The Media Link HD is a tiny black box that isn’t going to win any design awards orbeauty contests (sorry, we mean “scholarship pageants”). We don’t mean to say it’s an eyesore — far from it, in fact — it’s just not a product that the folks in Taiwan felt the need to put extra thought into, at least in the looks department. Measuring 84 x 52 x 12.2mm (3.31 x 2.05 x 0.48 inches), it’s smaller than a credit card and a bit thicker than the One X. 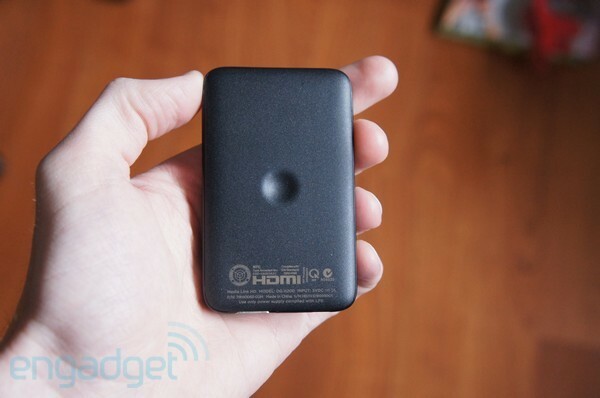 It also has a similar body and style as its predecessor, the DLNA-streaming Media Link. 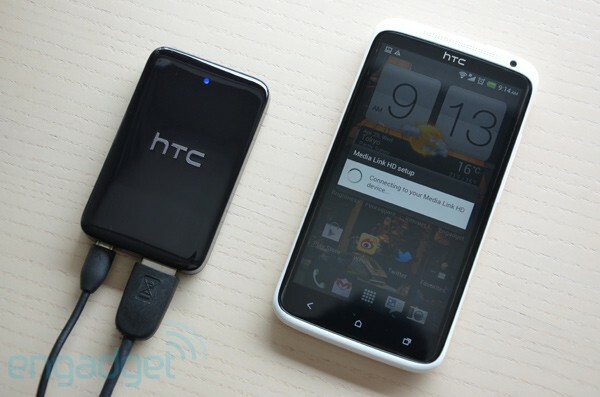 As for cosmetic differences, HTC opted for glossy, black on the top, while the bottom is constructed from a grainy, dark grey plastic. The back even has a cute little dimple smack-dab in the middle; if there’s a reason for it to be there (aside from hopes that a chorus of awws will magically ensue) we’re not sure what it is. Perhaps it makes the thing easier to grip when your thumb is there. Regardless, much like the rest of the Media Link HD’s design, this isn’t going to be a factor in your decision to purchase it. The new device keeps things simple on the outside, offering a single reset button on one end and a full HDMI port and Micro-USB charging port on the other. The concept of pushing media from your mobile device to your home entertainment network or a board room projection screen is certainly nothing new. In fact, it’s blossomed into an incredibly crowded market heavily saturated by thousands of DLNA-certified devices (one of which being the original Media Link) and services like Apple’s AirPlay. Samsung also announced a similar product in association with the Galaxy S III last month which takes advantage of WiFi Direct. Plenty of companies have even tried to put a unique spin on the idea — Motorola’s Webtop dock comes to mind — but that didn’t stop HTC from introducing the Media Link HD, an accessory embedded with proprietary technology that can, at present, only be supported by the prized One X, One S and EVO 4G LTE (sorry, One V owners). WE’RE CONCERNED THAT THE PROPRIETARY TECHNOLOGY MAY NOT BE A CONVINCING DRAW FOR DEVELOPERS. First and foremost, the new Media Link offers HDMI mirroring, which means everything you see on your mobile device can be displayed on your HDTV, computer monitor or other HD-compatible screen. But there’s a twist: when you’re watching a movie stored directly on your One X or One S (read: not on a third-party app, at least not yet), it won’t actually play on the phone simultaneously. Why? For the dual-screen effect. After all, it’s not like you’re going to be watching the latest Ryan Gosling flick on your TV and your phone at the same time, so why not use the smaller screen to check emails, post on Facebook or anything else? These are great features, but we’re concerned that the proprietary nature of the Media Link HD may not be a convincing draw for developers. We expect HTC will release a handful of devices that are compatible, but ultimately, the success of the accessory largely depends on how well the One series sells in the next few months. If few customers are buying these phones, even fewer will shell out the dollars for something that can’t be used in concert with other devices. And if nobody’s buying it, no developer will want to waste their time coding for it. HTC wanted to make the Media Link HD as portable (and simple to use) as possible, so it’s kept the setup process limited to just a few steps that, in all, shouldn’t take you more than a few minutes. After all, tethering the device to a computer or adding other complications just to get the thing to work would turn into a disastrous and incredibly frustrating experience for most. Your phone can connect wirelessly to the Media Link HD in two ways: they can latch onto the same WiFi hotspot, or you can establish your own peer-to-peer network if there’s too much WiFi interference or there simply isn’t an access point available. The setup process remains essentially the same for both methods of connection, though you’ll need to tell your phone to disconnect from and forget your current WiFi connection if you choose the P2P method. 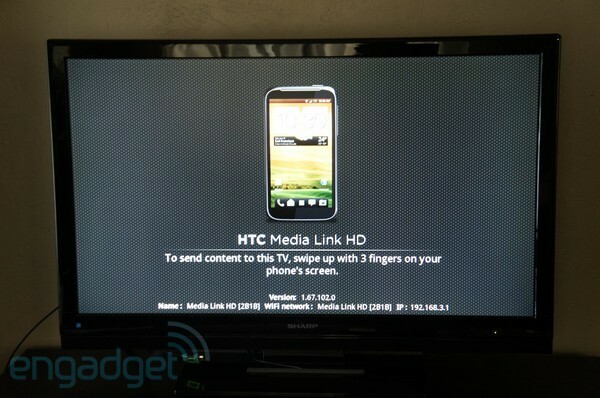 When you turn the Media Link on, you’ll be greeted with a message on your TV to slide three fingers up on your phone. Doing so for the first time will prompt the two devices to connect, and after roughly 30 seconds or so, you’re ready to go. 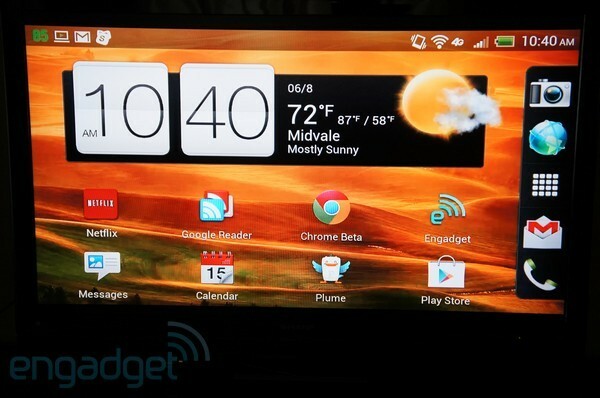 In a quick moment, your phone will automatically convert to landscape mode and your TV will be showing the same screen. Now that you’ve configured one phone to the dongle, how does it work if you have a house full of Ones? No sweat — just slide three fingers down to disconnect yours, allowing your EVO-toting roommate to hook theirs up. No extra setup is necessary: the only time you’d need to reconfigure is if you choose to switch from WiFi to P2P within the same area. Doing so causes the dongle to forget the earlier connection. Since it’s quick and easy enough to pair up your devices again, this isn’t really that serious an issue. In case things don’t work out so smoothly, there’s another method you can attempt before throwing the Media Link at the wall in frustration. 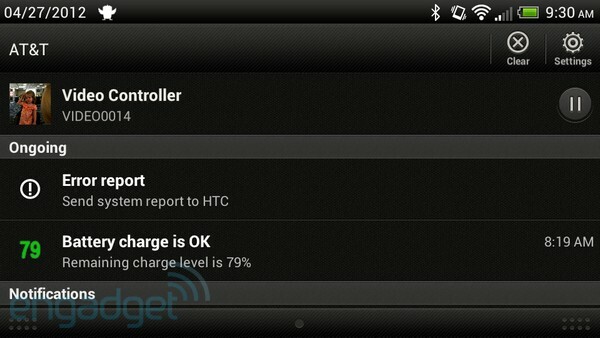 Within the Wireless & Networks section of the settings menu, you’ll see an option for the Media Link HD. This is where you’ll find a list of available devices; click on the one you’re currently trying to connect to and a setup screen will pop up. Three choices are available: Connect, Start Device Setup and Advanced Settings. 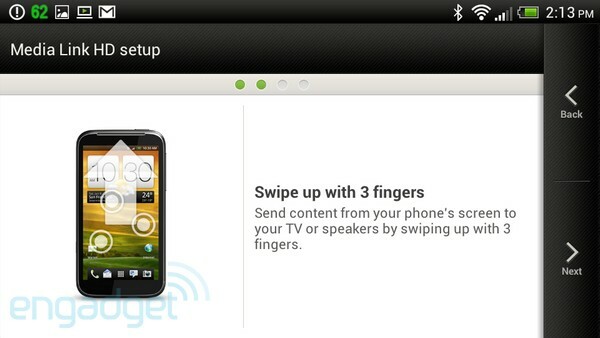 The Connect option essentially performs the same function as your usual three-finger gesture. 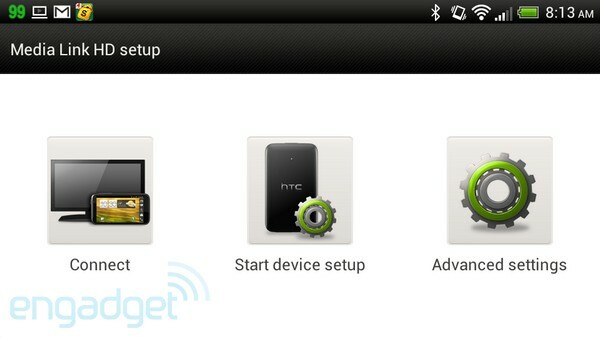 Start Device Setup prompts you to press the single button on the Media Link to restart the pairing process. The Advanced Settings option allows you to check for firmware updates, change language settings and change the P2P name and password. We found that Start Device Setup came in handy when we were attempting to switch from one WiFi network to another, but ideally you’ll rarely — if ever — need to give this a shot. You can also perform a hard reset by holding down the Media Link button for 10 seconds or so until a steady red light starts to glow. YOUR MILEAGE MAY VARY WHEN IT COMES TO LATENCY. Now that we’ve teased you by discussing hardware and setup first, let’s tackle the important question: how well does it actually work? We had the opportunity to test a bug-riddled pre-production unit last month, and received a final production-grade model more recently. It’s still not perfect by any stretch, but the improvement we saw in the latest hardware and firmware was significant. We won’t go into many details on how the pre-production unit performed, since it’s not the final product and doesn’t reflect the changes made during that time — let’s just say that we could have chucked it out the window on several occasions. Instead, we’ll discuss the version that consumers would receive if they were to buy one today. As mentioned earlier, the configuration process took 20 to 30 seconds to complete. Once we were hooked into the unit, the mirroring was smooth. We were able to flip through menus, screens and apps with ease. We observed some slight lag from time to time, but the few delays we encountered typically lasted just a second or two. All told, it had little effect on our overall enjoyment of the product. But mirroring is only one small part of the equation, Rather, the company’s main selling point is in the split-screen functionality — your ability to watch movies and home videos on the TV while simultaneously checking emails on your phone, for instance. We picked out a full-length motion picture in the Sense gallery and in no less than 10 seconds, the content had been pushed to the TV and all buffering was complete. Very seldom, if ever, did the movie have to pause for additional buffering. Latency was never an issue on the final product. Likewise, viewing photos was a snap, with each image only taking a second or so to be pushed over to the bigger screen. As a disclaimer, your mileage may vary when it comes to latency: slow internet speeds won’t adversely affect your experience, but since the Media Link relies on your router as a proxy, having a clean WiFi environment may be a make-or-break scenario. If you live in an area with a heavy concentration of wireless access points, interference can potentially slow down your dongle’s performance (if you’re using it in middle of the city, you’ll probably be better off using the Media Link’s P2P option). The same thing can happen if you have multiple devices using the same network — each one stealing a chunk of your precious bandwidth — or if your WiFi signal is weak. Plenty of multimedia formats are supported on the Media Link. For video, these include H.264, MPEG-4, .MOV, .3GP, .MKV, XVID and .AVI; for audio, MP3, WMA, AAC, HE-AAC v1 / v2, AAC-LC, WAV, AC3, Dolby Digital EX and DTS pass-through. If you want to play slideshows or simply look at individual pictures through the Media Link, JPEGs are the only files supported at the moment (a step down from the original, sadly). However, a firmware update coming in the near future will add OGG and FLAC to the list of compatible formats. We did notice a few quirks worth discussing. Even though all of our home videos and most of our movies ran smoothly, and even though we didn’t experience any loss in audio or video quality (on a 1080p HDTV at least), we encountered a few issues with movies that we’d ripped from a DVD and converted into MP4 format. While they looked and sounded perfect on a PC, they didn’t translate as well to the Media Link. There were a few instances in which video came through just fine, but the audio track was four-tenths of a second behind. Other times, the audio track was interrupted by an audible thump every second or so. After trying several different file types and sourcing methods (i.e., DVD ripping software, downloading, digital copies and video recorded directly on the One X), the only ones we had problems with were movies ripped from DVDs. After discussing the matter with HTC engineers, the company concluded there are some lingering issues with how the software encodes these movies, and the Media Link hardware has a difficult time properly decoding the audio. They’re looking into the matter and hopefully we’ll see this scenario resolved in a future update, but we bring this up in the meantime because many consumers may experience similar problems depending on where their files were sourced. If it’s happening to you, we recommend trying out different videos that originated using various methods to see if you can find a correlation with the issues you’re experiencing. Gaming is also a hit-and-miss experience: it all depends on which titles you’re trying to play. As much as we’d like our smartphones to become the next-gen gaming consoles, we haven’t arrived at that point just yet. The Media Link’s mirroring functionality isn’t going to give you reason to toss that Xbox or PlayStation in the garbage. Casual games — you know, anything in the Angry Birds / Temple Run echelon — will appear fine on the bigger screen, but graphics-intensive titles aren’t going to fare as well. THE BIGGEST LIMITATION IS THE AMOUNT OF STORAGE YOU HAVE ON YOUR PHONE. Aside from gaming the biggest limitation here is the amount of storage you have on your phone — not to mention the time and effort it takes to sideload movies onto your device. This may be a deal-breaker for DLNA fans. As we mentioned earlier, Netflix and other similar apps can still be mirrored onto your television, but no split-screen capability is available for them yet. Hopefully developers will find a way to get around this little niggle once the API is released; we’d love to see compatible apps remotely access and stream movies from our PCs. The inability to use the Media Link as a vehicle to connect your PC to your TV may disappoint anyone with a huge library of flicks to choose from — especially anyone that already has DLNA functionality. The $90 price point won’t attract impulse buyers casually wandering through the store either. With all that in mind, it does exactly what we’ve seen it do in the professionally-made videos and trade show demonstrations — and with some minor exceptions, it’s seamless. It isn’t the perfect solution for everyone, but One owners are left with few other media streaming options to choose from. With HTC’s homegrown selection, at least, you likely won’t find yourself desperately searching for alternatives.